Development of Automation Program of work of Manager. In the work is described step by step process of creating of application, which realizes automation of work of dispatcher cash desks in the sale of tickets at the bus station. The application must be realized in Microsoft Visual Studio at the C#. Database is realised in Microsoft Access. 10.3. Programming of methods of data displaying in controls dataGridView1, dataGridView2, dataGridView3, dataGridView4, dataGridView5. In the term paper we need to develop the system, which realizes automation of work in dispatcher cash desks at bus station. data about the driver who carries out transportation. We develop the database in the Microsoft Access. The name of database file is “02_02_00_009_Base_en.mdb”. The completed database you can download here. We call these table by the names: “Route“, “Ticket“, “Dispatcher“, “Bus“, “Driver“. Sixth table is the result of executing application with interconnection to database. In this table directly transportation is fixed. We call it the “Transportation“. 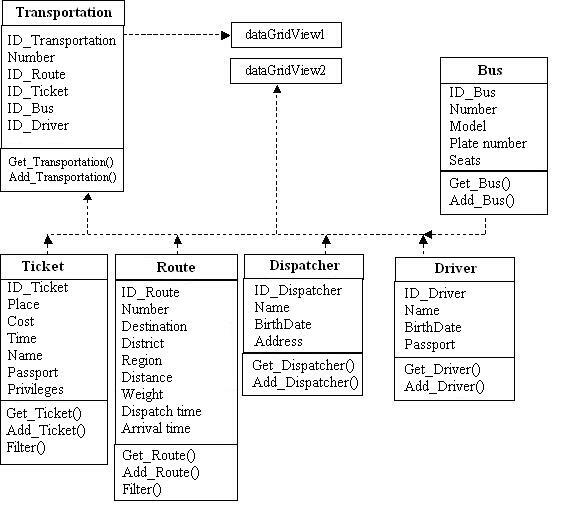 The tables “Route“, “Ticket“, “Dispatcher“, “Bus“, “Driver” is primary in relation to the table “Transportation“. 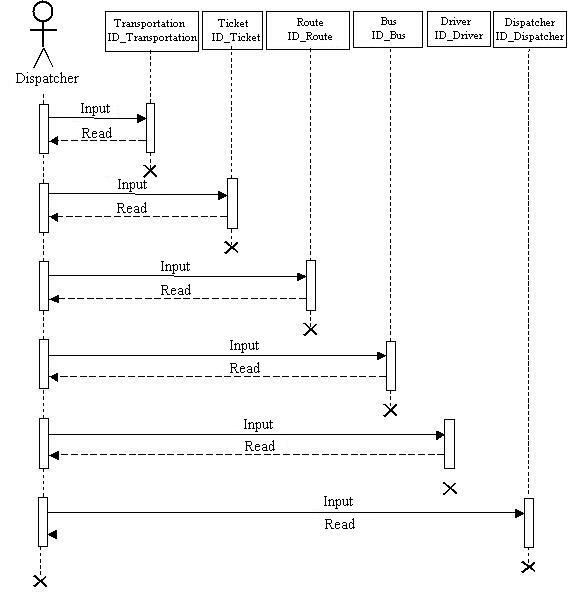 The interconnection scheme between tables of database is shown in Figure 1. The model of database was based on using of unified modeling language UML. 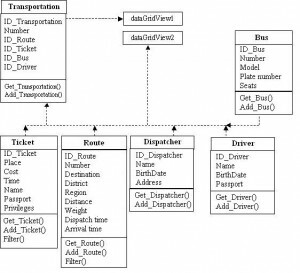 In order not to go into the details of developing a database in UML language in this article we describe basic UML-diagrams. Diagram of using the UML-language (Fig. 2) gives the answer on the appointment of system in the outside world. In general, the diagram of activity shows the decomposition of some activity in its component parts. 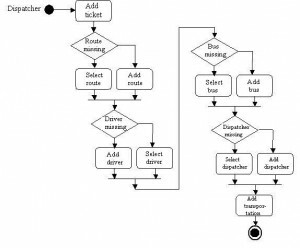 Activity diagrams are used for modeling business processes, manufacturing processes, serial and parallel computing. In the interaction diagram shows only those objects that are directly involved in the interaction. The key point for interaction diagrams (or sequence) is the dynamics of the interaction of objects in time. In the construction of UML models, is distinguished the concept of class. The class is called the description of sets of objects with common attributes. Graphically, a class is displayed in the form of a rectangle. The software system is developed from the viewpoint of the database model and uses six classes, each of which is the object that corresponds to this or another database table. Next steps describe the developing of application. Run MS Visual Studio 2010. 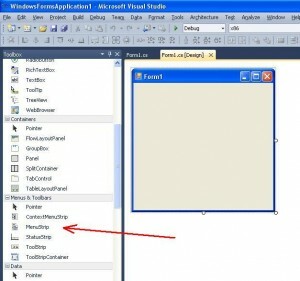 Create the project as Windows Forms Application. 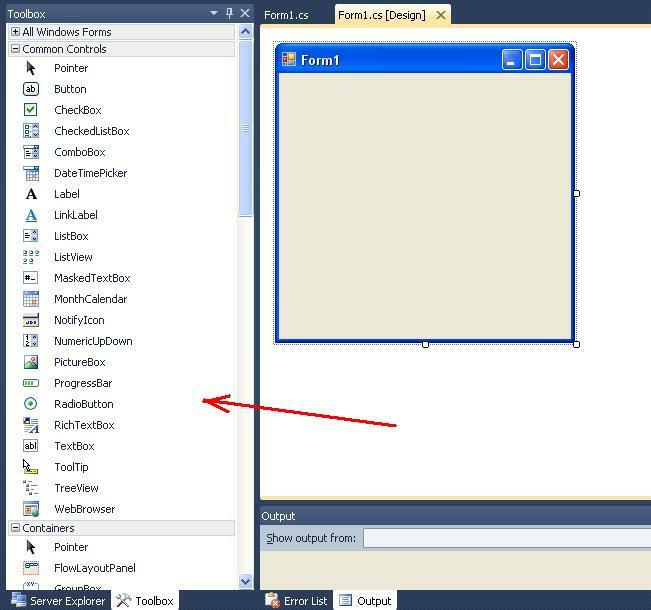 The name of application is set by default “WindowsFormsApplication1“. As a result, the empty form of application will be created. This form shown in Figure 6. On this step we will connect the database “02_02_00_009_Baza_en.mdb“ to our application. The process of connecting database to application, in details, is described here. On this step, the wizard of connecting the database to application is called. This process contains several steps. To call the process of connecting to database, you need to call the command “Add New Data Source…” from menu “Data“. In the window of selection of type of database source we select “Database“. 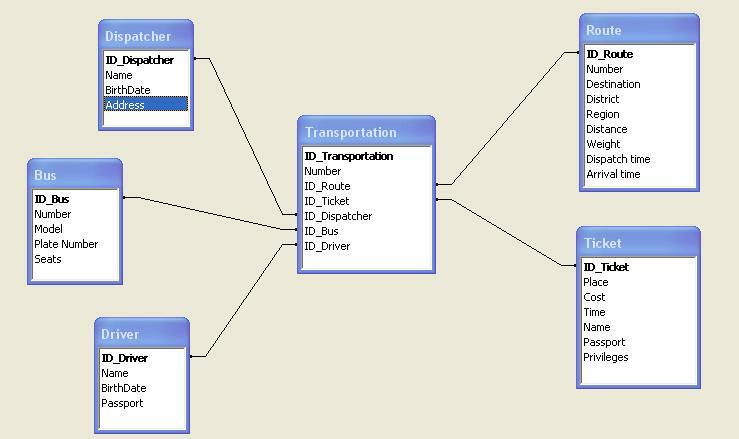 In the window of model of connecting to database we select Dataset (model based on the dataset). In the window of selection of connecting with database we select “New Connection…” and in the following window we select the type of connection “Microsoft Access Database File (OLE DB)“. Save the Connection String to the Application Configuration File we give the answer “Yes” and connection string we don not change. In the window “Choose Your Database Objects” we select all tables and finish the work of wizard by clicking on the button “Finish“. After executed actions, with the help of wizard of connection to database, the window of “Server Explorer” will have view, as shown in Figure 7. In order to programmatically control the database and get access to methods, which operate with database, you need to connect namespace System.Data.OleDb. To design the form you need to use controls from panel “Toolbox” (Fig. 9). 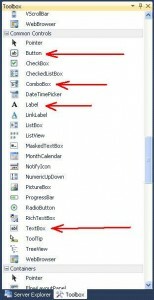 To create menu, you need to use control “menuStrip” from tab “Menus & Toolbars” of panel “Toolbox” (Fig. 10). Developing the menu using control “MenuStrip” is in detail described here. We develop menu as shown in Figure 11. We are changing the form size and we place on the form two controls “DataGridView” from tab Data of panel Toolbox (Fig. 12). We activate tab “Containers” from panel “Toolbox“. Place on the form 4 controls of type GroupBox (Fig. 13). As a result we get four objects with names groupBox1, groupBox2, groupBox3, groupBox4. Using these names, you can get access to the properties and methods of these objects. 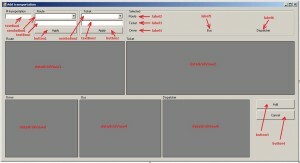 Set the caption for groupBox1 object. It is carried out with the help of property Text as shown in Figure 14. The value of property “Text” is equal “Filter”. In this group will be placed objects, which realizes a filtering of data to database. in object groupBox4 property Text = “Commands”. After the changes, the application form will have view as shown in Figure 15. Controls of type “Button” and “TextBox” are located on tab “Common Controls” of panel “Toolbox” (Fig. 16). In the area of object groupBox1 (“Filter“) we place the one control of type “ComboBox”, two controls “Label”, one control “Button” and one control “TextBox” (Fig. 17). in the button1 property Text = “Apply“. 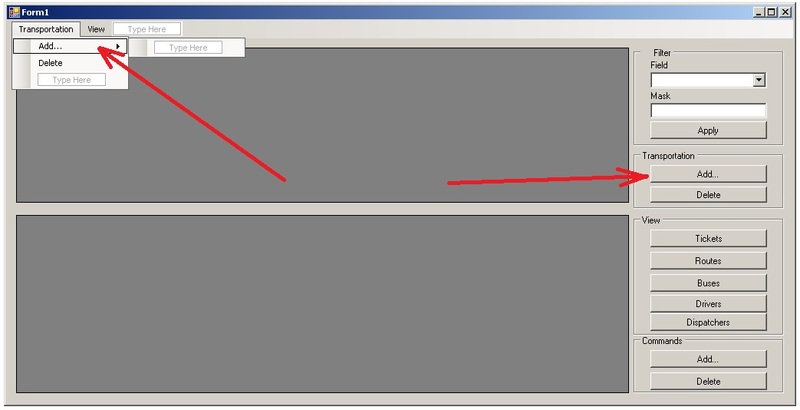 In additional, we change the size of controls button1 and textBox1 for more demonstrative view. After the changes, window of form is looks like (Fig. 18). Thus (p. 5.5), we form the group “Transportation” (groupBox2). 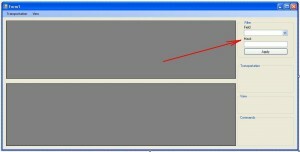 From the panel Toolbox we place two controls of type “Button” and we form their properties “Text” as shown in Figure 19. Two objects of type “Button”, which are named “button2” and “button3”, will be created. The property “Text” of object button2, we set to value “Add…“. The property “Text” of object button3, we set to value “Delete“. 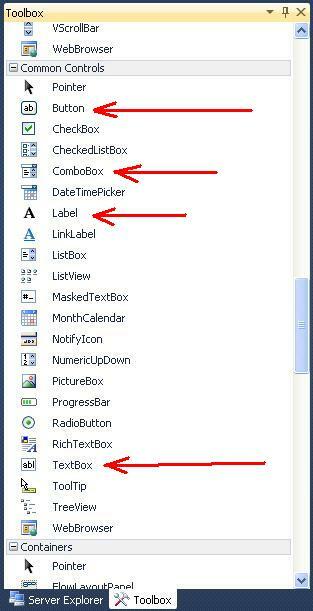 From panel “Toolbox“, we place 5 controls of type “Button” in the area of group “View” (object groupbox3). We correct size of these controls. As a result, the 5 objects named as “button4”, “button5”, “button6”, “button7” and “button8” will be created. in object button8 property Text = “Dispatchers”. After designing, the application form with the formed group “View”, will have the view as shown in Figure 20. In group “Commands”, we place two controls of type Button. Two objects which are named “button9” and “button10”, will be created. Set the property “Text” of these objects to values “Add…” and “Delete“. As a result, the application form will be as shown in Figure 21. Control (object) comboBox1 from group “Filter” must include the fields, for which will be applied the filter with the purpose more convenient output of data from database. To call the process of forming the list, we need to call the editor of strings of control “comboBox1” (Fig. 22). To do it, after activation (selecting) comboBox1 we need to click on the button “>” (right arrow). The menu, in which we select “Edit Items…“, will be opened. 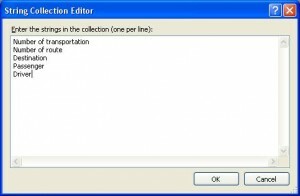 As a result, the window “String Collection Editor“, will be opened. In this window, we type the fields names, where the filter will be set. After that, when we press on the “OK“, the strings of control “comboBox1” will be formed. In the following program codes, where we will operate with database, the property “ConnectionString” is used. You need to read this property correctly. 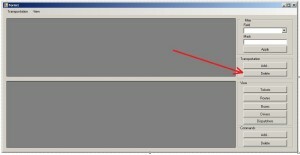 The property “ConnectionString” consists information about data provider and where located the file of database on the drive. 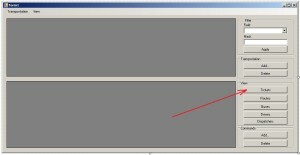 in the “Properties” window, select the property “ConnectionString” and copy it to the Clipboard. It is necessary to note the following. When you will use the string “ConnectionString” in the code at C#, you need to replace the symbol “\” to symbol “\\“, according to syntax of C#. The class “Form1” corresponds to main form of application. When we writes program code, we will use some internal variables of general use. These variables are “Connection String” and “act_table“. First variable will contain the string of connection to database “Connection String“. Let’s add the text of “ConnectionString” to text of class of main form of application. Using “Solution Explorer” we open the file “Form1.cs” with the help of command “View Code” (Fig. 25). As a result, the tab with program code will be created. This code is described into file “Form1.cs“. Let’s modify this listing in such a way, that two variables ConnectionString and act_table were added to it. The variable “ConnectionString” is described as “public“, because it will be used in other classes. For convenience of displaing in the design window, we breake the string of variable “ConnectionString” at the parts. Data, which we need to show in the control dataGridView1, will be formed from different tables. 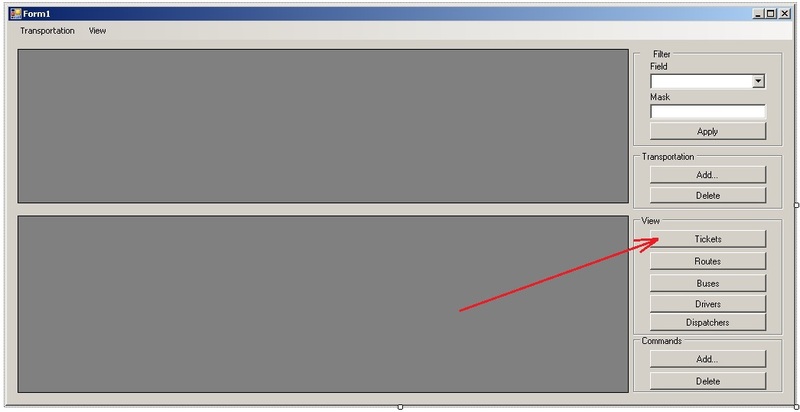 To filtering data, we need read the string, that is selected in comboBox1 and read the mask from textBox1. In the control comboBox1, user can select the field, which indicates the field of data filtering. In the next table are displayed fields, which will be shown in dataGridView1. 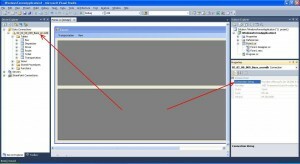 where textbox1.Text is the text of filter in the control textBox1. 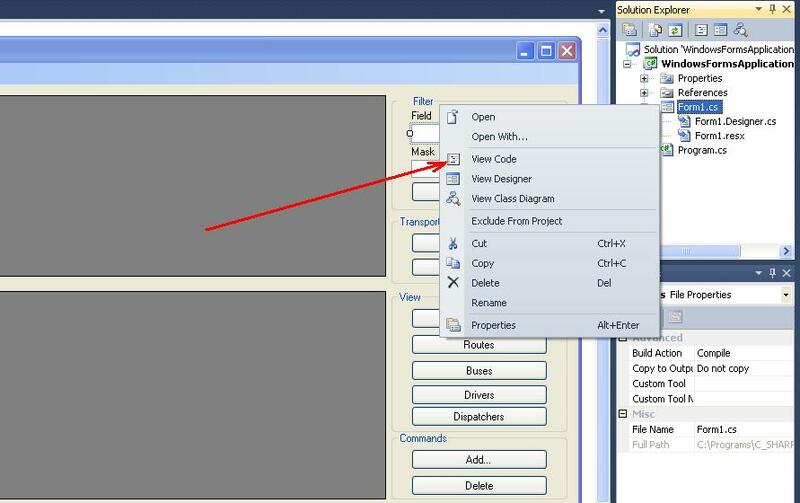 We can call the data output using filter by clicking on the button “Apply”. Process of event programming in MS Visual Studio is described here in details. 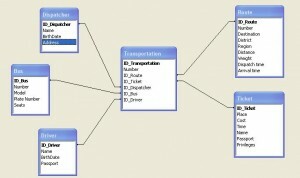 The output of database in the control dataGridView is described here. We program the event of click on the button “Apply”. Event handler of clicking on the button “Apply” is the following. First, in the variable CommandText, is added the string of SQL-query, which displays all data from database. Then, according to filter value, in the CommandText is appended corresponding string, which finishes SQL-command. After building CommandText string, the object of type OleDbDataAdapter is created, which forwards the data sets from the calling process and back. Data adapters contains the set from four internal command objects. It is commands of reading, inserting, changing and deleting information. As we see from the program code, the constructor of object is getting the string as input parameters of query at the SQL-language and string of connecting to database. So, the object of data adapter is connected to our database. The data set is a kind of intermediate buffer for data that can be displayed. A data set is a convenient mechanism for reading and updating data and encapsulates a set of tables and relationships between them. After that, data from table “Transportation” will showed on the form. Method Form1_Load() is called when form is loading. 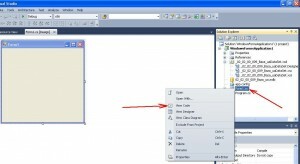 Append into this method calling of method of event handling button1_Click(). At present, listing of method is the following. To add a new transportation you need to click “Add” button from “Transportation” group. 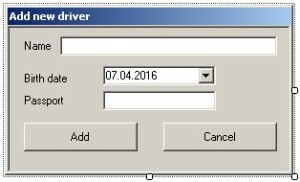 To create a fields, which are used in the displaying of transportation (control dataGridView1), you need to create corresponding form. In the opened window, you need to select “Windows Form”. The name of form we leave as “Form2.cs”. As a result, in “Solution Explorer” we get the files “Form2.cs” and “Form2.Designer.cs”. 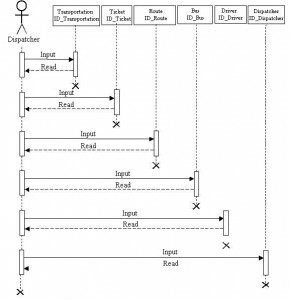 At the Figure 26 is displayed the form, which shows data for transportation. 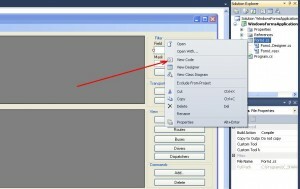 Resize the form “Form2.cs” and place on the form controls as shown at the Figure 27. The names of controls, which will be used in program code, are pointed by red color. Fig. 27. Form “Form2.cs” with the description of controls names. In general, form “Form2.cs” is shown at Figure 28. Call the event “Click”, which is generated when user clicks on the button “Add” of form “Form2“. The process of programming of new event is described here. To display data in controls of DataGridView type, we create additional method Get_Table(), which gets two input parameters. Parameter table_name specifies the table name in database. Parameter num_dG specifies the number of control of type DataGridView – from 1 to 5. For example, if “num_dG=2“, it means that are displayed only data of control dataGridView2. Next step, we program the event Load, which is called when form “Form2” is loading. For this event, will be called the corresponding method Form2_Load(). In Form2_Load() method will be called one by one Get_Table() method, which fills all 5 controls of DataGridView type. When you change the active cell in controls of DataGridView type the event CellEnter is generated (Figure 29). Code listing of event handlers CellEnter for controls dataGridView1, dataGridView2, dataGridView3, dataGridView4, dataGridView5 is the following. In the control comboBox1, user can select the fields from table “Route”, which will be used to filter data. The process of forming of strings in the controls of type ComboBox is described in p. 6. In the form “Form2” you can apply the filter to tables “Route” and “Ticket”. Applying the filter to table “Route” is realized with the help of component comboBox1, textBox2 and button1. // Filter to the table "Route"
Filter for table “Ticket” applies when you pressed the button “Apply” in the group “Ticket”. Control of this button is named “button2”. Also, for the filter you need to use controls comboBox2 and textBox3. In textBox3 field you need to specify the filter value. 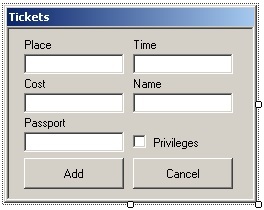 In the comboBox2 you need to specify the field from table “Ticket”, for which we are using the filter. // Filter to the table "Ticket"
To read from Form1 the values of some controls of Form2, you need to change the directive of visibility from “private” to “public”. To realize this we need to call file “Form2.Designer.cs” (Fig. 30). This completes the creation the form “Form2.cs“. The form “Form2” is shown, when user clicks on the button “Add” from group “Transportation” (see Fig. 21). The control of type “button”, which corresponds to command “Add…” is named button2. In the method My_Execute_Non_Query() is created the object, which realizes the connection with database. Then the command, which changes database, is executed. To do this you need to use method ExecuteNonQuery(). commands that change data into database. After that, you can test the application. You can call the “Add…” command from group “Transportation” and you can add the string of transportation in the table, which is displayed in dataGridView1. When user selects button “Delete” (button3) from group “Transportation”, you need to program the method of event handler of click on this button (Fig. 31). We create the form by a standard way. 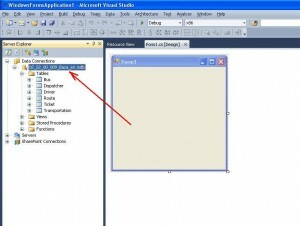 The process of creating the form in MS Visual Studio C# is described here in details. As a result, in “Solution Explorer” we get files “Form3.cs” and “Form3.Designer.cs”. Previously you need to prepare the form by the pattern, as shown in Figure 32.
two controls of “Button” type (buttons “Yes” and “No”). When user calls the command “Delete” from group “Transportation” then must be called the form “Form3.cs”. 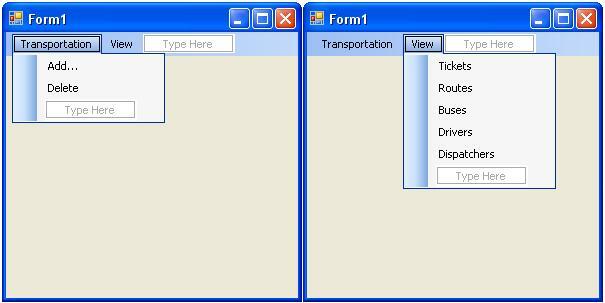 To display table “Ticket” in dataGridView2, user must click on the button “Tickets” (button4) from group “View” (Fig. 33). // Click on the button "Tickets"
Now, you can test the application. 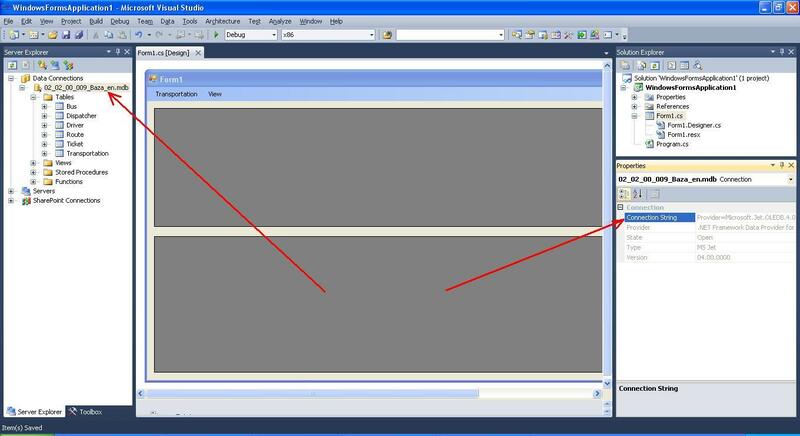 The output of table “Route” in dataGridView2 is carries out with the help of command “Routes” (button5). To output table “Bus” in dataGridView2 you need to call the command “Buses” (button6). 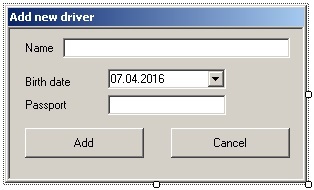 Table “Driver” is output in dataGridView2 when user presses on the button “Drivers” (button7). To output table “Dispatcher” in control dataGridView2 you need to select the command “Dispatchers”. 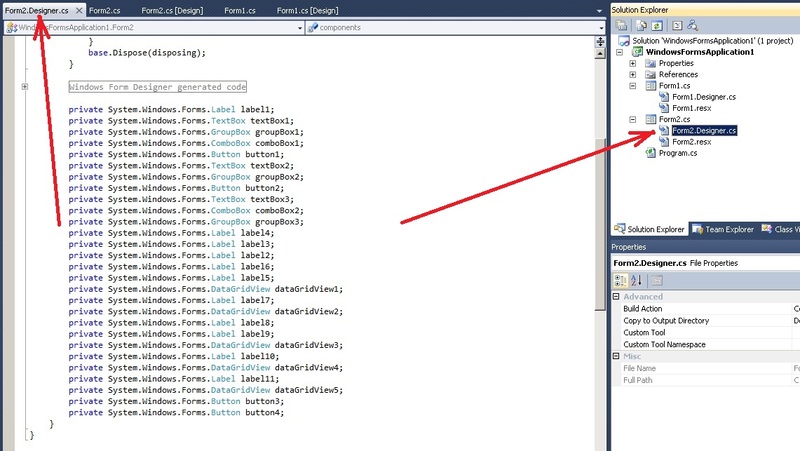 Creating a new form in MS Visual Studio C# is described here in details. We add a new form. We create the form, which adds a new ticket using the example that shown in Figure 34. Files, which correspond this form are “Form4.cs” and “Form4.Designer.cs”. 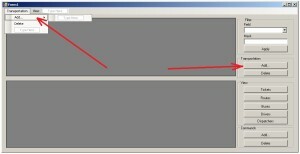 property StartPosition = “CenterScreen” (the window is displayed at the center of screen). After creating the form, you need to set the visibility outside for some fields of class Form4. To do it we go to the file “Form4.Designer.cs” (see Figure 30 for the form “Form2.cs”). We set the access public for meaningful fields of form “Form4.cs” – textBox1, textBox2, textBox3, textBox4, textBox5, checkBox1. We can do this by another way simply changing the field “Modifiers” in the window “Properties”. We program the event of clicking on the buttons “button1” and “button2” in the same way as described in p. 11.2. 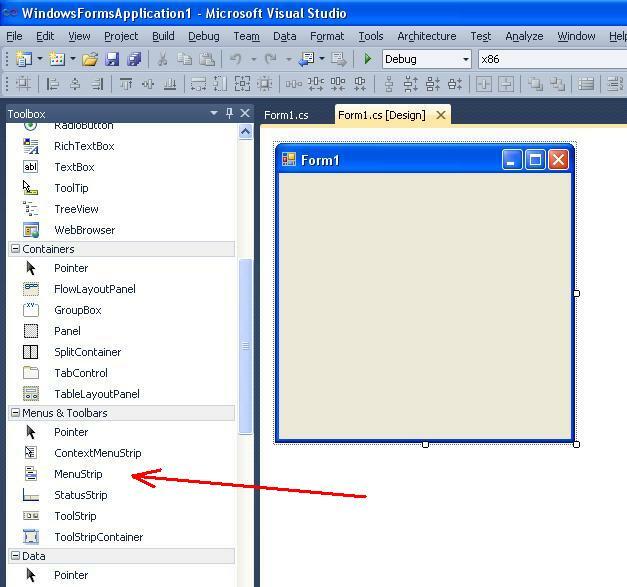 Creating a new form in MS Visual Studio is described here in details. Create the form as shown in Figure 35. 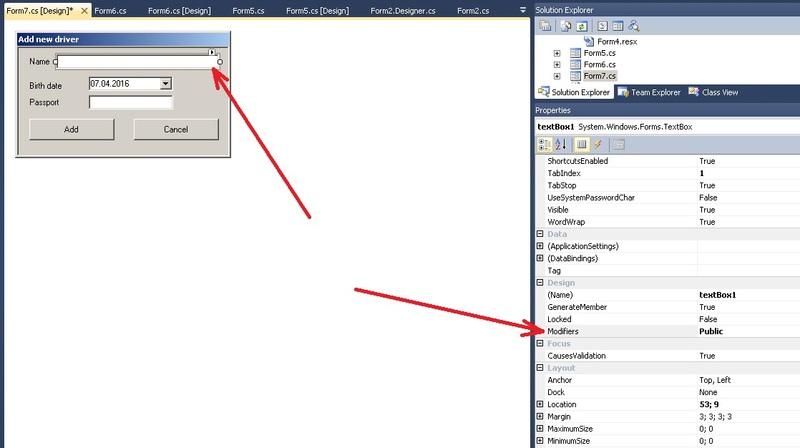 As a result, in Solution Explorer we get the files named “Form5.cs” and “Form5.Designer.cs”. 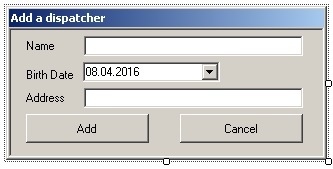 In controls “dateTimePicker1” and “dateTimePicker2”, we set the property “Format” into value “Time”. Set the access “public” for meaningful fields of form “Form5.cs” – textBox1, textBox2, textBox3, textBox4, textBox5, textBox6, dateTimePicker1, dateTimePicker2. We program the handler event of clicking on the buttons button1 and button2 in the same way, as described in p. 11.2. Creating a new form is described here in details. The form, which needed to add a new vehicle, is shown at Figure 36. The files “Form6.cs” and “Form6.Designer.cs” correspond to this form. Set access “public” for meaningful fields of form “Form6.cs”: textBox1, textBox2, textBox3, textBox4. We program the event of clicking on the buttons “button1” and “button2” in the same way, as described in p. 11.2. Form of adding a new driver is shown in Figure 37. 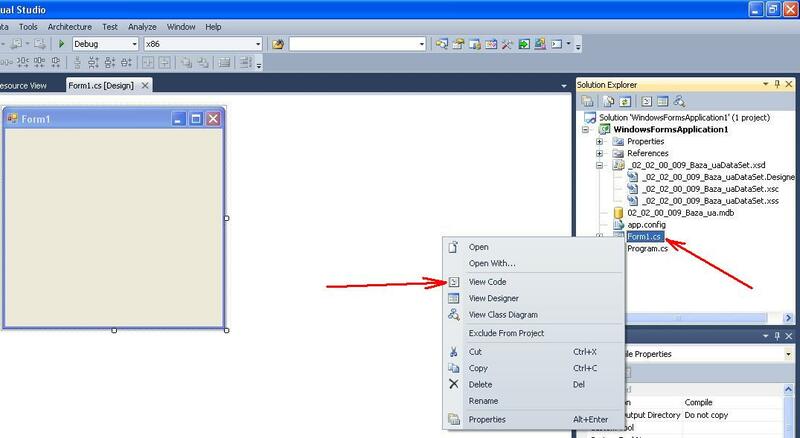 To the newly created form in “Solution Explorer” correspond two files: “Form7.cs”, “Form7.Designer.cs”. We set properties of form in the same way as described above. In the control dateTimePicker1 we set property “Format” into value “Short”. Automatically, the file “Form7.Designer.cs” will be changed. The form, in which we add a new dispatcher is shown in Figure 39. The files, which corresponds to the form are named “Form8.cs” and “Form8.Designer.cs”. We set the properties of form in the same way as we did it in the previously forms. Automatically, file “Form8.Designer.cs” will be changed. We program the events of clicking on the buttons “button1” and “button2” in the same way as described above. All of the following steps will be executed on the main form “Form1.cs” of application. Therefore, first of all we activate the form “Form1.cs”. is formed, which is executed in the method My_Execute_Non_Query(). Code listing of method Add_Route() is following. s_disp_time = Convert.ToString(dispatch_time); // Convert departure time to string. CommandText = "INSERT INTO [Route] ([Number], [Destination], [District], [Region], [Distance], [Weight], [Dispatch time], [Arrival time])"
+ " VALUES ('" + num_route + "', '" + destination + "', '" + district + "', '" + region + "', "
Method Add_Route() gets as input parameters the values, which corresponds to the fields of table “Route”. Code listing of method Add_Bus() is following. 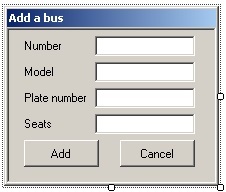 CommandText = "INSERT INTO [Bus] ([Number], [Model], [Plate number], [Seats])"
Method Add_Bus() gets input parameters, which corresponds to the fields of table “Bus”. Code listing of method Add_Driver(), that adds data into table “Driver” is following. CommandText = "INSERT INTO [Driver] ([Name], [BirthDate], [Passport])"
Code listing of method Add_Dispatcher() is following. 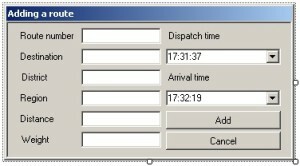 CommandText = "INSERT INTO [Dispatcher] ([Name], [BirthDate], [Address])"
In the main form “Form1.cs”, when user selects button “Add…” from group “Commands”, you need show one of the windows, which correspond adding data into the tables “Ticket”, “Route”, “Bus”, “Driver”, “Dispatcher” (Fig. 40). To do it, using the tools of language C#, you need to call the corresponding form. After inputting data to the form and selecting of confirmation query, data from the form must be added into the corresponding table of database. if (act_table == 2) // table "Route"
// adding data into the table "Route"
if (act_table == 3) // table "Bus"
// adding data into the table "Bus"
if (act_table == 4) // table "Driver"
// adding data into the table "Driver"
if (act_table == 5) // table "Dispatcher"
// adding data into the table "Dispatcher"
As you see from program code, using the variable “act_table”, the corresponding method is called which adds data in database. Program code of event of clicking on the button “Delete” from group “Commands”, is following. if (act_table == 1) // process the table "Ticket"
if (act_table == 2) // process the table "Route"
if (act_table == 3) // process the table "Bus"
if (act_table == 4) // process the table "Driver"
if (act_table == 5) // process the table "Dispatcher"
Last step, is the appointment to commands of menus (see p. 5.1 and Fig.11) the execution of corresponding event handlers. They are called when user clicks on the buttons, that are placed on the main form. 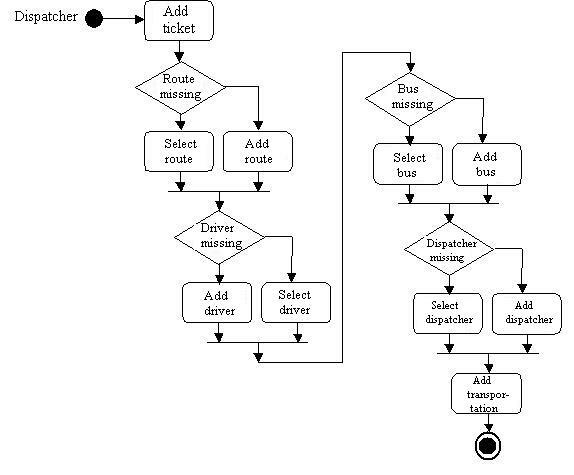 For example, the command “Add” from menu “Transportation” should perform the same job as the command “Add…” from group “Transportation”, which is placed on the main form (Fig. 41). Therefore, it is inappropriate to write code twice of handler of adding transportation. 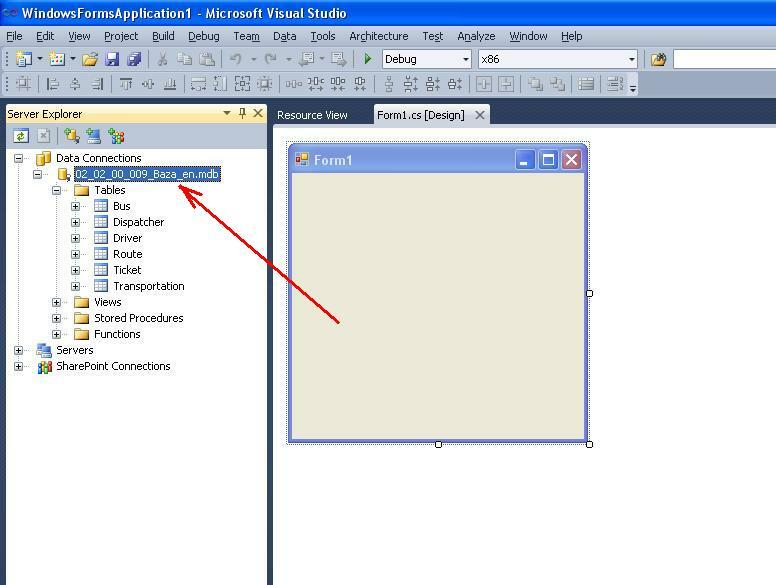 Microsoft Visual Studio allows the system to assign the execution method (if already programmed) to other command (see. Fig. 42). 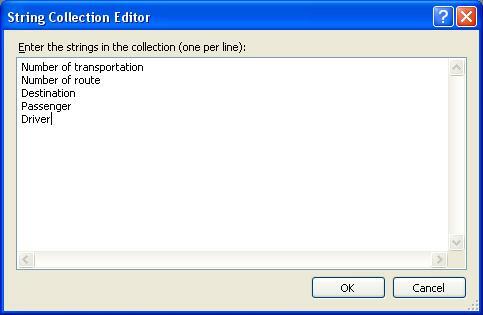 Command, that adds the transportation from main form is called by clicking the button “Add…” from group “Transportation”. This button corresponds to the object named button2. The method of event handler of clicking on the button 2 is named “button2_Click()” (see p. 11). in the field “Click” select the method “button2_Click” (from dropdown list). 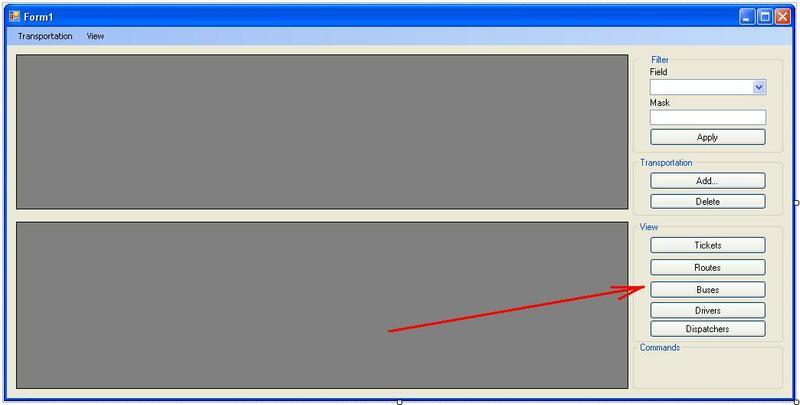 for command “Dispatchers” from menu “View” we appoint the event handler button8_Click. Now you can run the application and use it. 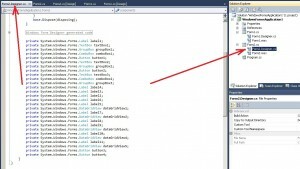 Connecting to MS Access Database in Visual Studio 2010. 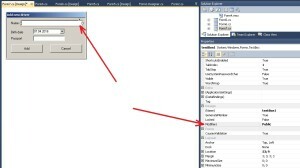 How to convert a MS Access database into MS SQL Server format. An example of demo application which manipulates data in the table of database MS SQL Server (SQLEXPRESS). 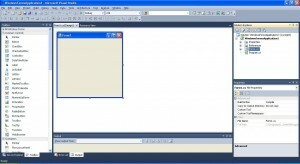 Previous Post011 – C++ Builder. 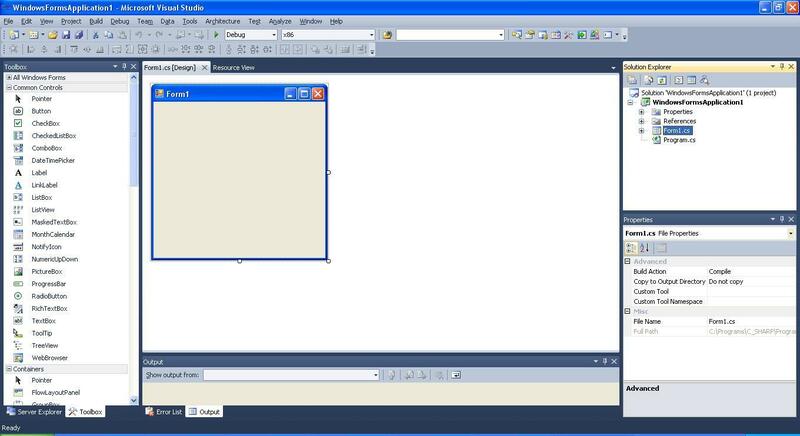 Developing the application of solution of the system of linear algebraic equations by GaussNext Post010 – Delphi. An example of sorting in database using component TADOQuery.